Architect Thomas Corbasson and VS-A have come up with a conceptual project for an organic skyscraper that grows as the building’s residents recycle. Materials such as glass and paper that are disposed of correctly by residents, will be put back into the building, adding to its vertical structure. The skyscraper is outfitted with rubbish collection and sorting areas, as well as a recycling plant that will be used to repurpose the waste into useable construction materials. 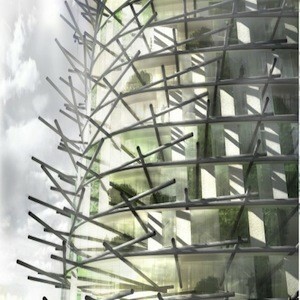 It is estimated that enough recycled material for the building’s façade could be produced within a year. Prefabricated hollow tube framing will serve as scaffolding and will rise with the building, allowing for components to be added to the structure over time. The scaffolding framework will also support generators supplying power to parts of the skyscraper. The innovative project proposal recently earned a special mention at the 2014 Skyscapers and SuperSkyscapers Competition held in the UK.